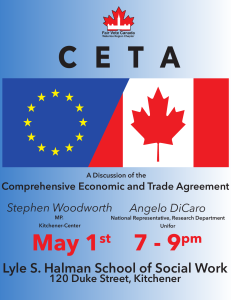 This Thursday the Fair Vote Canada Waterloo Region Chapter is hosting a panel discussion on CETA, the Comprehensive Economic and Trade Agreement. On the panel are Stephen Woodworth, Member of Parliament for Kitchener Centre, and Angelo DiCaro, trade researcher for Unifor. The discussion will be moderated by Cathy MacLellan. Cathy provided a link to a paper from the Canadian Government, Technical Summary of Final Negotiated Outcomes, Canada-European Union Comprehensive Economic and Trade Agreement (.PDF file, 756.6 kBytes). This document consists of 26 pages of bullet points, which look more like the minutes of a meeting than a policy statement or an analysis. Perhaps there is a more in-depth coverage on the Government’s propaganda information site, Canada’s Economic Action Plan. Or perhaps you should come to the panel discussion!